Triskaidekaphobia: noun, From the Merriam Webster’s dictionary is an irrational fear of the number 13. In Western cultures, the number 13 conjures up dark images of ghosts & ghouls, witches & demons. Gamblers and those among us that cling to superstitions dread the intersection of the number 13 with the unluckiest day of the week, Friday. So, it’s fitting that in their 13th year Sweden’s Dozer should descend upon us like a vampire bat to unleash their darkest and heaviest collection of tracks to date. “Beyond Colossal” is Rock and Roll crafted in the finest traditions of Black Sabbath and then bathed in the sublime blanket of the winter sunlight in Sweden. As with hundreds of other young Swedish bands, Dozer was the obvious answer to the boredom of a small town youth in a land where the sun seldom visits. After forming in 1995, Dozer emerged in 1998 with their debut 7″ which was awarded “Single of the week” in KERRANG! magazine. 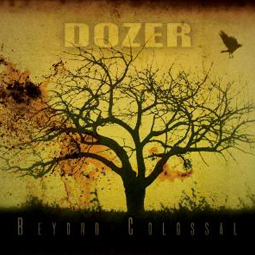 Dozer quickly progressed beyond their early influences and created a style of their own incorporating modern elements into their classic heavy rock sound. A sound that always has been intensely heavy but yet also strongly song and melody driven by the distinctive vocals of singer Fredrik Nordin. Dozer has carefully culivated a following like none other and a reputation second to none due mostly assuredly to their constant touring and explosive live shows. Dozer scattered releases on labels like Meteor City, Man’s Ruin, & their own Molton Universe before finding a home here at Small Stone. With albums like “Madre De Dios” & “Through the Eyes of Heathens” these simple Swede’s have established themselves as a force to be reckoned with in the world of stoner rock, often placed upon the same pedestal as the fathers of the movement – Kyuss and Monster Magnet. With the release of their 5th full length album “Beyond Colossal,” these sons of Sweden seemed poised to teach the Underground a lesson or two about what Rock and Roll is all about. Recorded between Studios 301 in Stockholm and Rockhuset Studios in their hometown of Borlänge, “Beyond Colossal” oozes with both the bleakness and beauty of the landscape. One can almost feel the sub-arctic winter cold that forces Tommi Holappa’sfingers to moves with superhuman speed alternating between beer chugging riffs and lightning solo’s. Of course a tour is in the works, and as anyone that ever seen Dozer live will tell you, this is a band that always gives 110%. With a resume of live shows that reads like a who’s who’s of Rawks newest and greatest (Mastodon, Rollins Band,Hellacopters, Clutch, and Unida to name just a few) the men of Dozer have proved one fact over and over again: Dozer are not to be missed. Guest vocals on Empire’s End and Two coins for eyes by Neil Fallon.